A small plane has crashed into a residential building in Valencia, the capital of Carabobo state in west-central Venezuela. Two people are said to be dead. It remains unknown whether people inside the building were injured. Interior Minister Miguel Rodriguez Torres confirmed the death of the two people, identifying them as "the pilot, Captain Luis Alfredo Maldonado and co-pilot, Captain Rodolfo Enrique Di Lena Diaz, who both died in the accident." A twin-engine plane with a capacity of eleven people crashed for unknown reasons at 10.30 local time (15:00 GMT), in an area about 3 kilometers from the international airport of Valencia Arturo Michelena. Torres noted that so far the damage had been limited “to homes, building and parking, plus or minus 6 vehicles are seen affected by the impact of the plane." 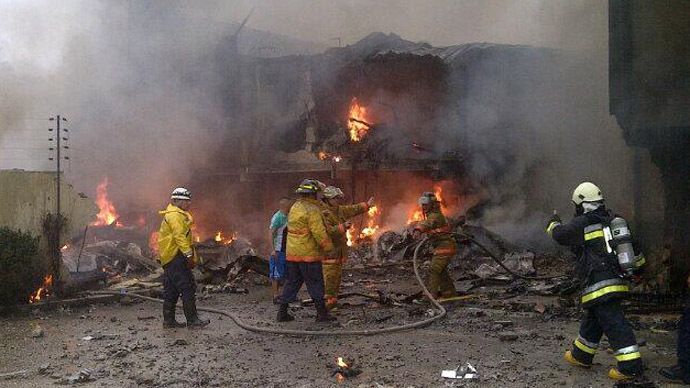 "We are now investigating and controlling the fire that was caused by the plane crash. We are also examining the scene since there are gas and electricity lines, to find out if are there any other casualties at the scene," he said.